This picture reminds me of the fresh start of tomorrows and the beauty of todays. These thoughts get me through the roughest times and shine light on many of the best times. I am 36 years old. I am raising two teenage kids on my own. I work full-time and am a part-time student. The list of I am's can go on and on, but let's stop at this one: I am a lifetime suffer of a weight control issue. Maybe lifetime isn't true but I was 4 years old when I broke a wrist climbing a cabinet to reach the peanut butter while my parents weren't looking, so I think to say lifetime is justified. The compulsion continued from there and is still a day to day struggle. There are many arguments for nurture versus nature that could apply here. Not only did I grow up watching one of my parents eat compulsively and struggle as well but it has happened for many generations in my family. So, my thought on the nature versus nurture debate is this: it is both. I have the gene for addiction and my addiction of choice is food. I believe this vice was the one I "chose" because I saw others around me participate in the same behavior. It is almost acceptable in my family. Acceptable in that no one talks about it. There have been many ups and downs, literally, over the years for those of us who struggle, but there comes a time when the ups and downs take a negative toll on your body. Let me preface this paragraph by saying, I AM NOT A DOCTOR. The chart to the left was taken from Wikipedia. 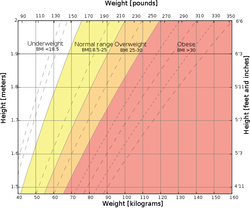 These are the normal ranges for all of the classifications of BMI, Body Mass Index. Your BMI is calculated by a formula that includes weight and height. The purpose of the BMI calculation is to estimate adiposity, that is, the density of the adipose tissue in the body. There are three classes of obesity, moderately, severely, and very severely obese. Although BMI is an indicator of obesity, it is not the only determining factor. Age, risk factors, and overall health are taken into account. The general consensus is that there are 3,500 kcal per pound. These kilocalories are the amount of energy that it would take a human on average to burn off one pound of body weight. In a typical day, a healthy male should consume 2,500 calories and a female should consume 2,000 calories. These amounts are to maintain current weight. To lose weight, each person should consume less, to gain weight, each person should consume more. (Please consult a doctor for the actual numbers that are right for you). In the philosophical sense, what is healthy for one person may not be healthy for another person. To play off a quote in Forrest Gump, healthy is as healthy does. I am not here to convert you to my way of thinking or do tell me I am not right, I am just here to pass along some information that has helped me on the path to recovery from unhealthy to healthy. How did I get healthy? So, here it is: I eat less, I move more, and I have expanded my toolkit. By that I mean that on March 13, 2012, I was fitted with a gastric lap band. The decision was never one I thought I would make until my primary care doctor looked me in the eye and told me that I needed to consider all options and that surgery does not equal failure. For me, she was right. I started the long and arduous process of finding the right surgeon and after care facility plus working with my health insurance company to make sure all of my I's were dotted and T's were crossed. I chose the lap band for many reasons. The lap band is adjusted around the upper part of your stomach and creates a pouch that can hold approximately 1-1 1/2 cups of food at a time, depending on your level of restriction. The lap band can be removed with no permanent cutting and rearranging of your insides. The lap band can be adjusted to create more or less restriction. The adjustments are made by the surgeon by adding or removing saline from the band via a port located generally near the navel with a syringe. The lap band surgery itself takes less time to recover from. With the lap band there are no off limit food choices. The decisions on what to eat are all mine and there are no physical reactions to eating certain food types as experienced with a gastric bypass. These are the reasons this was the right choice for me. I am only 14 weeks out from surgery and my doctor already told me he sees me as one of the successes from his office. Of the patients that choose the lap band over the other weight loss surgery options, he said 1/3 of his patients do very well (like myself), 1/3 lose some weight but are not willing to make significant lifestyle changes for greater success (lower calorie intake, exercise), and the other 1/3 have no success at all. I am pleased, lucky, fortunate, dedicated, and excited to be part of this 1/3. My teens are seeing a difference in lifestyle and my biggest hope is that it is not too late for them to learn and make positive lifestyle changes now that will carry over in to the rest of their lives.